Let me first say, thanks for a great site and for all of you who share your knowledge to help take away the mystery and much of the fear of DIY pool care, I became a TFP supporter and went to Pool School and have had nothing but crystal clear water ever since. The problem I am having now is that I believe i ran the water line too low and ran the pump dry too much specially on the initial start and burnt the bearing. At first it sounded just a bit like a clothes dry with a elliptical sounding rotation, then one morning i was there when the timer began the pump and it was seized for about a minute before it started and it still ran and pushed enough water to vacuum with but at this point it sounded much more like a 6 cyl firing on 5 cylinders. Good news bad news, its fall in the northeast and the pool is now closed and i have a few frigid months before its season again so i have time to perhaps rebuild this unit myself. Seems the impeller is pressed onto the shaft, anyone have a suggestion on removing, im guessing a puller, but any input on redoing this pump would be appreciated. Other consideration, ditch the pump and upgrade to to a 3hp pump, I have never really been able to run my discharge propelled cleaning unit, doesnt seem to zoom it enough, always stuck in the deep, I also run a bank of 10 solar panels, about 25 feet from the pump that definitely puts a bit of a load on it. I figure it is not so bad cause the flow is slower to move through absorbing more heat. Quick question: What size is your plumbing? Both on your pool and to/from your solar. You do not need a 3 HP ( ) pump either. Way too big, and you'll have a hard time finding one anyway (I've never even seen one personally). On a 6 hour turnover you need about 95 gpm (without adding your solar, plumbing run, etc.). I also wouldn't run on anything smaller than 2 1/2" plumbing on that 2 HP pump, which is why I asked about pipe sizing, and 3" would be better! If you have small pipe diameters, even the 2 HP is too big. You might want to consider a multi speed pump (if you do not rebuild the one you have) and longer run times for turnover. 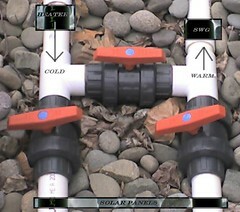 Slower water through the solar will produce hotter water, as it sits in the panel a little longer. I've never rebuilt a pump (although they look pretty simple), so I can't help you there. Sorry! Q : The problem I am having now is that I believe i ran the water line too low and ran the pump dry too much specially on the initial start and burnt the bearing. A : Your pumps bearing do not require water to perform properly, it would be a mechanical seal that would be damaged due to lack of water but most pumps strainer baskets retain enough water to be self priming. If your mechanical seal was bad it would leak water during operation. 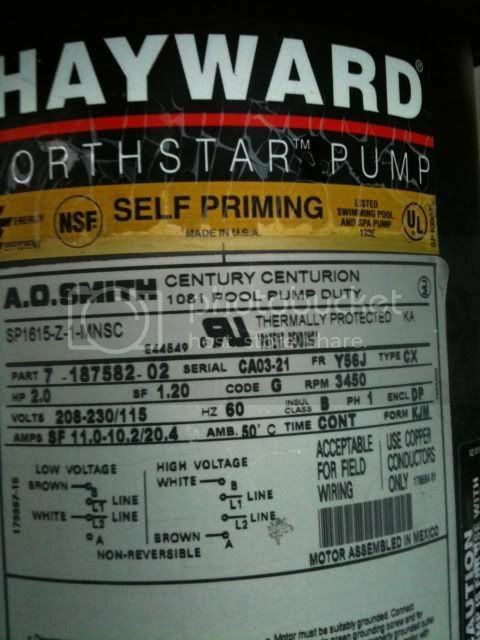 I suspect your pump problem is related to a bad connection/wiring at the starter condenser or a bad condenser. Corroded connections to the motor can cause this too. These starters are cheap and can be had at any wholesaler, bring your old one in for comparison...they are all pretty much the same and there are universal ones on the market that work with 99% of the motors out there. You can check your motors bearings by rotating the motor by hand once the impeller is removed, it should be smooth with no sticky spots or grinding...easy to check once the impeller is off. Q : Seems the impeller is pressed onto the shaft, anyone have a suggestion on removing, im guessing a puller, but any input on redoing this pump would be appreciated. 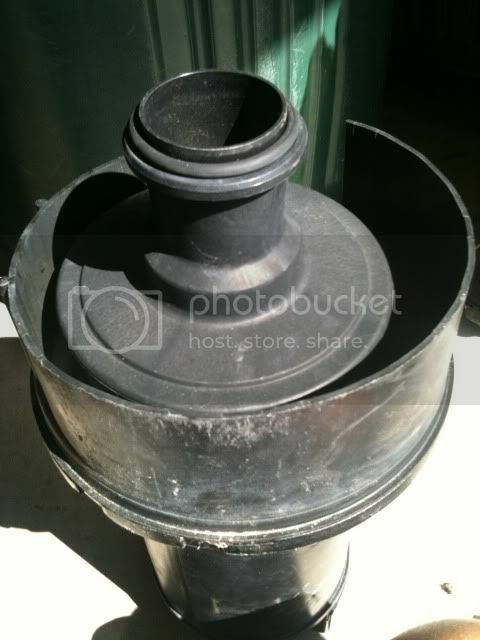 A : Your impeller appears to be threaded on, the notches in the impeller nose indicate to me a threaded connection. To remove a threaded impeller you need to remove the fan end of the motor to get to the end of the motor shaft (behind the starter condensor), in general there is a hex or hole in the end of the shaft that will allow you to use an allen key to prevent rotation of the motor shaft while you turn the impeller off. You can use a piece of wood or other suitably sized object that fits into the notches of the impeller to rotate it off. BEWARE most impellers are left hand thread unless the direction of rotation is reversed or rotates counterclockwise, check first before applying torque to the impeller as yours appears to be fiber filled plastic which is very brittle and easily damaged if abused. It should turn off quite easily once you figure out which way to rotate it. Q : Other consideration, ditch the pump and upgrade to to a 3hp pump, I have never really been able to run my discharge propelled cleaning unit, doesnt seem to zoom it enough, always stuck in the deep, I also run a bank of 10 solar panels, about 25 feet from the pump that definitely puts a bit of a load on it. I figure it is not so bad cause the flow is slower to move through absorbing more heat. A : With your unit being 2HP already (I don't know how big your pool is?) I would hesitate to running larger to make up for a solar setup, I would seperate the systems and run a small 1/2HP or 3/4HP booster just for the solar and keep your 2HP for cleaning the pool. However you could just valve out the solar system when you want to run the cleaner to get full flow and keep your existing setup the way it is....unless your solar is plumbed direct of course. You have choices in how the system is run but your existing plumbing will dictate what is possible, can you post a picture of your setup so we can get a better idea? As Chuck said the impeller is threaded onto the shaft and running your pump dry didn't have anything to do with ruining the bearings. It does sound to me like the bearings are the problem and need to be changed. How do they sound and feel when you try and turn them by hand? I did not notice any leakage, though i did notice i was suckin air from somewhere, though i think i fixed that with thorough cleaning of the strainer basket seal, which i think was why they pump was starting dry. I travel a lot for work and the rest of the family chooses not to mess so... but anyway.. I never noticed a leak, where would it leak from? 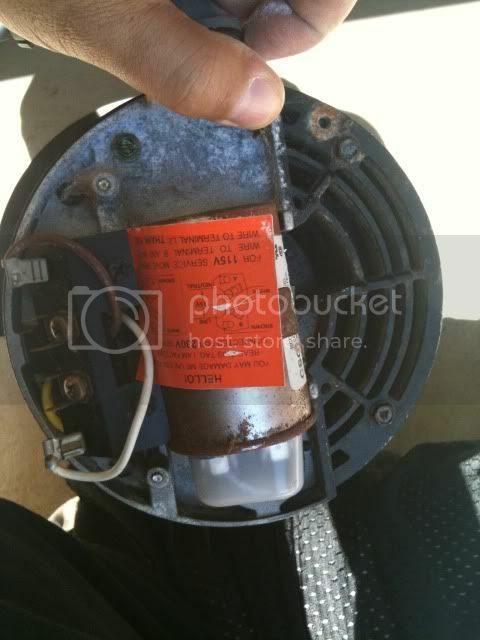 back side through motor? The condensor, I am guessing its is the picture below..
half bright and shinny and the other looked like it had been barbequed, not sure if that is just the way it is but seemed suspect. 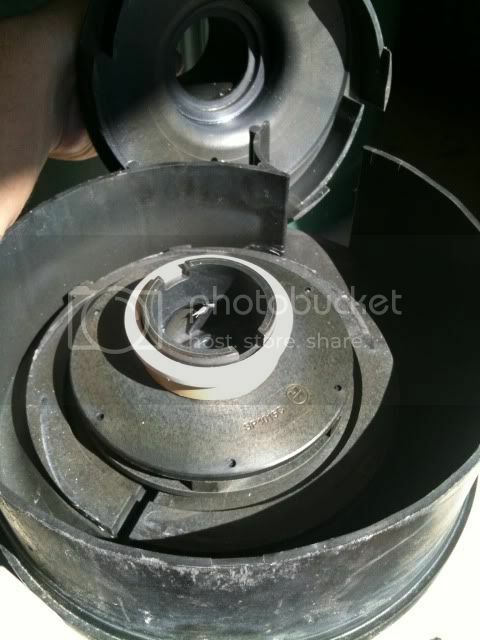 once i got the motor apart from the impeller, i gave it a good spin, seemed fine, i did notice a bit of slop, but i am guessing that was due to not having the backing plate on, cause once i put it back on with the shaft in the holder, it seemed to spin smooth with no grind or grip. The only other thing that really i noticed was the seals/or gaskets that sit just before the hex shaft, bearing had a ton of grease all up in there, and they (two gasket/seals) were a bit dinged up like seemed bent a bit but i spun the bearing on shaft and seemed tight and smooth. 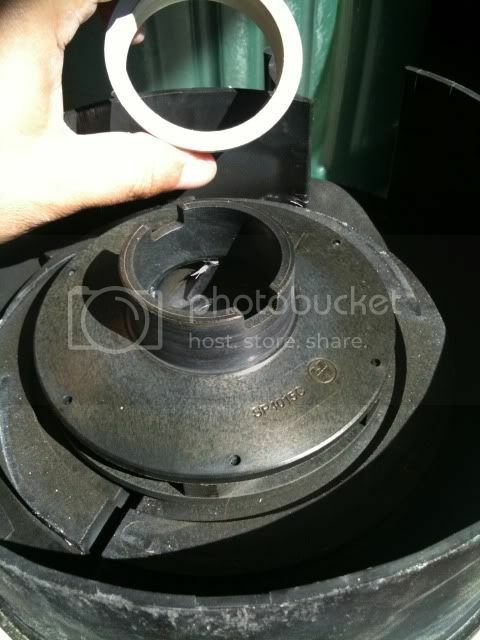 Since it is apart, should i get a rebuild kit anyway or is there any of these gaskets or seals that are one time use? I guess i am at the point of replacing that solenoid and putting it back together, anyway to test besides back on the pool? I am wondering if i should invest in a dual speed, since i dont mind running it all day and my electric bills scream, perhaps it would cover the cost of a new pump in a relativity short time and actually be better for the solar heating. BEWARE most impellers are left hand thread unless the direction of rotation is reversed or rotates counterclockwise, check first before applying torque to the impeller as yours appears to be fiber filled plastic which is very brittle and easily damaged if abused. It should turn off quite easily once you figure out which way to rotate it. can you post a picture of your setup so we can get a better idea? check out the rest of the shots.. There is a thread of pics, of when the pool caved in after heavy rains and tore down the rebar in the deep end, two pizzas and a couple of sodas, and the repair crew managed to make the deep end about 2 feet wider! Hmmm, that armature does look scorched...I would have it "growled" before I put it back together. Essentially your looking for shorts and an electric motor "growler" uses an magnetic field to check the continuity of the windings. A high pot test will do the same thing but you risk damage to the existing insulation doing a high voltage test. Any place that rebuilds electric motors or automobile starters/alternators will have a "growler" and can test it for you. At this point you really have to think if a new motor is a better investment that repairing what you have, if the armature is shot it could cost almost as much as a new motor. 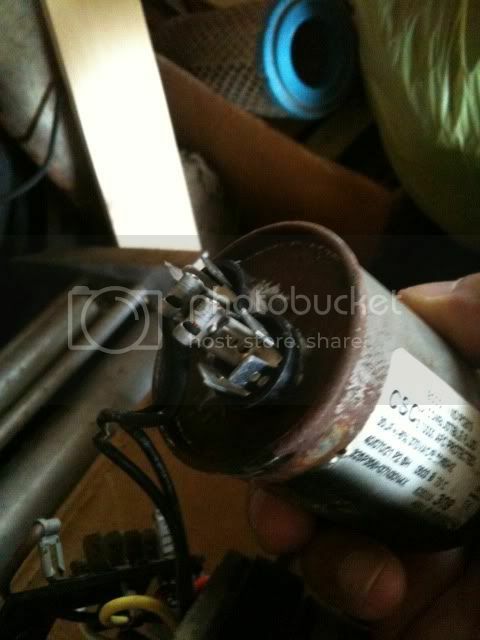 If it were me, I would just replace the motor...you get a new warranty and you can start from zero. I would throw on a new mechanical seal while I was in there too. 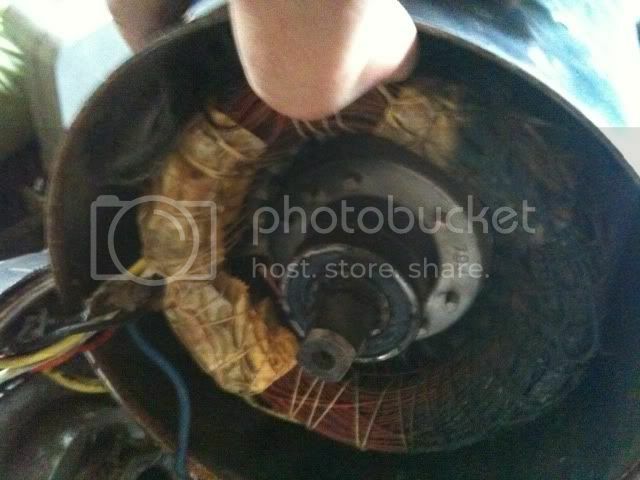 Its too bad, it looks like the starter overheated and cooked the winding insulation. We don't see that kind of failure that often up north unless the motor is in an extremely hot location but if your in Arizona or Cali I guess this is what can be common in your area. Have you tried valving out your solar while you run the cleaner? I was totally satisfied with the performance of the 2 HP motor, it gave me enough push to run solar panels along with the filtration system. So which 2hp to go with? Many choices, hoping to get some sort of direction. from that page anyone have a recommendation? I would recommend the IntelliFlo VF, which will allow you to set the exact flow rate that you want for each application. This will allow you to optimize the performance of the solar and it will save you money in electrical costs. Also, in your signature, you list a "40k btu heater". Do you mean 400k Btu? If 40 doesnt make sense then yes probably so.. I never even really use the gas heater with the solar, perhaps when i run the spa.. Thanks for the recommendation, I will definitely have to look into that, I suppose its a pay me now or pay me later in that the initial cost is higher but will be a better value in the long run.